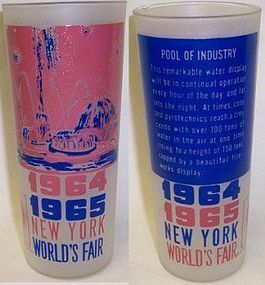 This is one really nice 6 1/2 inch high Frosted Tumbler featuring the 1964-1965 New York Worlds Fair. This Tumbler measures 2 3/4 inches in diameter at the top and is in very good condition with no chips or cracks. The decorations are all very good and legible. The back of the tumbler features the Pool of Industry Water Display story. I pictured both sides of the tumbler for your information. Be sure to search our other Worlds Fair items available. We guarantee all items to be as described. Feel free to email with any questions. THANK YOU.